The other big addition to Gmail is the expansion of Google’s Smart Compose feature to Gmail’s mobile versions. Gmail for Android will be the first mobile app to get the update, with Smart Compose slated to hit Gmail for iOS sometime later. And with Google adding support for four new languages (Spanish, French, Italian, and Portugese) to Smart Compose, the feature won’t be strictly limited to English-speaking Gmail users anymore either. Outside of these updates for Gmail’s 15th birthday, Google has made a number of other recent additions to Gmail such as bringing customizable swipe actions to Gmail on iOS, a more dynamic desktop interface that lets Gmail combine things like comments from a Google Doc into a single thread, and richer content that allows emails to behave more like live websites instead of static newsletters. 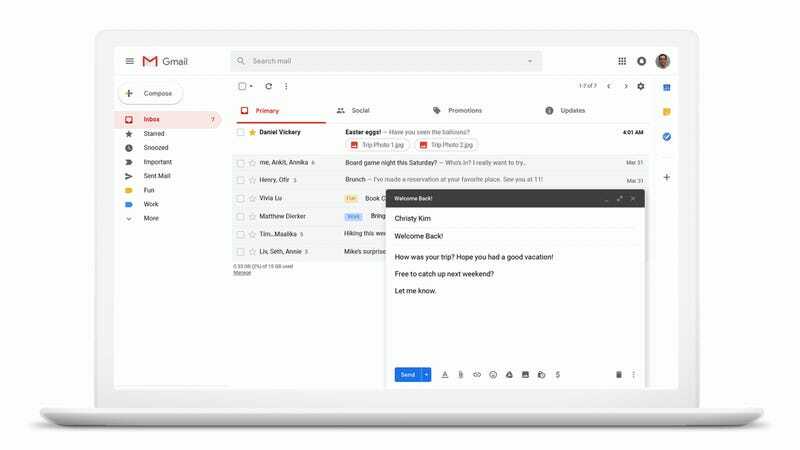 While these changes are generally welcome upgrades to Gmail, they still might not be quite enough to soothe the sting of Google Inbox users, who are scheduled to lose access to Inbox tomorrow (April 2) when Google shuts down the service for good. Though with 15 years in the books, it’s probably safe to say that unlike Inbox, Gmail won’t find it’s way onto the list of things killed by Google anytime soon.